Recently I stumbled upon some new monster figures that made me geek out in a major way. They're the kind of thing that's pretty much tailor-made for lovers of the kind of stuff you see here on Little Weirdos. 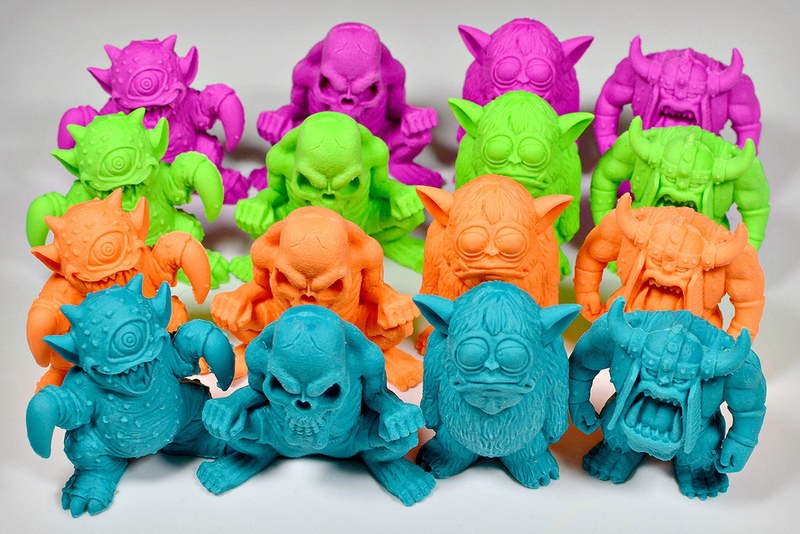 I'm talking about new monster erasers that are currently being sold by school supply retailer Geddes! 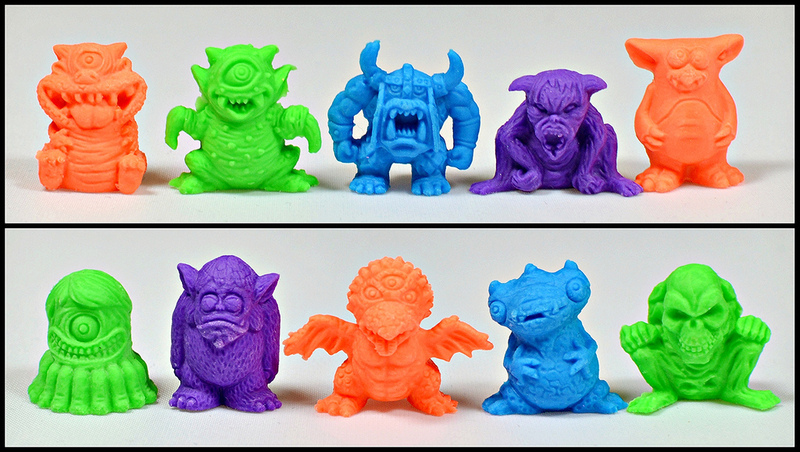 There's four really cool designs that make up the set of "Mega Monster Erasers," and they come in four different colors--neon blue, neon orange, neon green and neon purple. They're about 2" tall, but once I had them in hand they felt quite a bit bigger than what I expected--probably because the dense eraser material gives them some serious heft and the sculpts are on the bulkier side. So who's in the lineup? First we have a potbellied cyclops-alien thing, which is shown above in green. As you can see from his mouth, he's the happiest of the bunch. There's a lot of great detail on this sculpt, like the creases and bumps all over his body. Next we have my personal favorite, a crouching skeleton dude in shorts. There's nothing too new or different about a skeleton monster, but I just really like the sculpt--check out his super sinister expression. Then there's a fanged furry beast with pointy ears with a dopey expression that makes him look like he's either braindead on some powerful stuff. I love all the personality this figure has. It kind of reminds me of the Spanky Stokes mascot monster, Stroll. Finally, there's an awesome battle-ready monster with a big, gaping mouth that looks kind of like a cross between a Blemmyae and a viking. Excellent stuff. These guys are sold in bags of 24 on the Geddes site here. And there's more! I also found out that the same company is selling mini versions of the monster erasers as well. 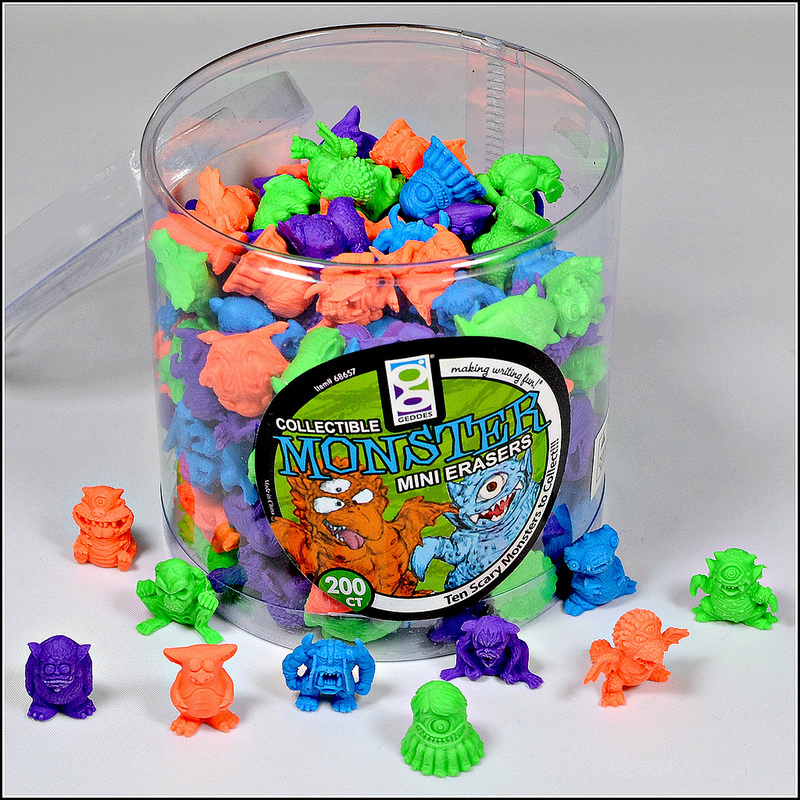 They're called "Collectible Monster Mini Erasers," and they're sold in a little plastic container of 200 pieces. The color scheme is the same as with the big figures, with each sculpt coming in all four colors. For some reason, though, the purple used for the mini erasers is a deeper purple than the one used for the Mega Monsters. These guys are about 3/4" 1/2" tall. They're very, very tiny. Their larger counterparts tower over them. They definitely picked some of the coolest ones to include in the Mega set, but all these little guys are pretty great. I particularly like the guy in the upper left that looks like a weird mix of a dragon, a cyclops and the Cheshire Cat, the sitting horned demon dude that's for sure the most evil-looking of the bunch, and the tubby little frog-alien guy (shown in blue in the bottom row). What do you think of these guys? Do you plan on picking any up? I reckon these guys are awesome! But the big ones are too big and the small ones are too small. Would be nice if there was some the same size as Mimp. Yeah, it's kind of strange that they went with those sizes, but despite that they are indeed awesome! These are fantastic, thanks for the heads up! They look MASSIVELY more different in size than 3/4" to 2"! I like'm though - the first time I happened across Deiner monsters they were sold as rubbers (what we call erasers) in a school supply shop. So there's that nice link at least. I just measured and you're right, they're more like 1/2" or under. Their website lied! Well if you can't trust sellers of rubber monsters, who CAN you trust?? I also noticed Geddes has some boss monster finger puppets that I've been hoping to find in an A&A toy vending machine, but it's tempting to buy a big ol' bag of 'em from the Geddes site! I've heard of people finding them in vending machines, but they never seem to get stuff like that in vending machines near me. Any idea if these are available any place else? I haven't seen them anywhere other than through the Geddes site. Sent ya a message on Instagram. I can't believe I missed these! And they are literally nowhere to be found now.